This is one of our favorite pasta I often do at home. 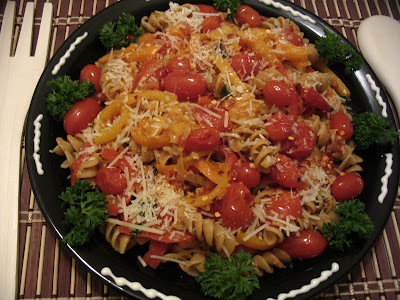 So healthy and easy to make and you can get different flavors from garlic and herbs, crunchiness from bell peppers, mild sweet taste from cherry tomato and off course no cheese no pasta. But it does not mean it has loads of cheese just for topping. Sure it will satisfy your taste buds. Here goes the recipe..
1. Add the pasta in the boiling water with some salt let it cook. 2. Meanwhile heat olive oil in the frying pan, add the garlic shallots and saute till golden brown. 3. Add the grated garlic and red chilli saute till lightly brown. 4. Add the cherry tomato it gets warm and starts bursting , at that time add the bell peppers. 5. Saute till the moisture are absorbed. Now check for the pasta and if it is cooked add to this mixture and add the dried herbs and chopped basil. 6. Toss well and serve it in bowl or plate and top it with grated cheese. 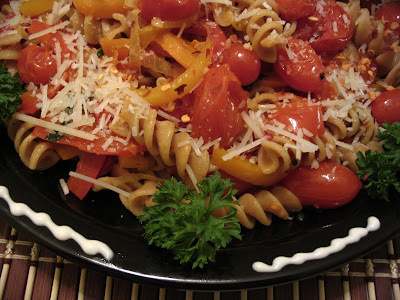 Pavitra, the pasta looks so colorful and I love the tomatoes sitting on the top along with the cheese and peppers!!! sounds heavenly... Send me the plate for dinner!!! yummy yummy :) it looks really delicious..
Lovely pasta Pavithra! Love the cute round tomatoes on it. So tempting! Beautiful Pasta Dish! looks really tempting..
Lovely looking pasta. Very colourful n inviting. First time here. U have a lovely space dear. Lovely dish, looks yum with all the different combination of colors. Fabulous pasta Pavitra it is so colourful and healthy looking. 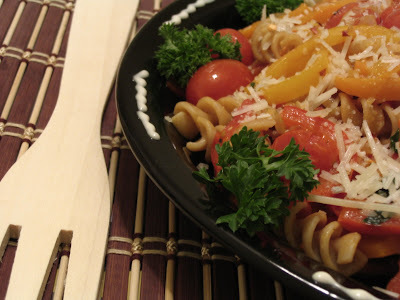 The pasta looks very colorful.Bell Pepper is such a wonderful veggie...yummy one! Pasta looks delicious. It looks like u have rainbow in ur platter. So colorful and yummy! Yours looks perfect ! wow that is so tempting pavithra..Plz pass me that plate....and thanks for your encouraging words gal..
Love the combination of bell peppers n pasta! Looks so yummy! I wud love to finish the whole plate !! I love every single ingredient used - this looks like a delicious meal. pastas are my all time favorite and you can experiment with different vegetables.This look delicious. pasta looks very colorful n beautiful Pavithra!!! Lovely pasta... I just miss it now..yummy...and what a presentation again...mind blowing. tomatoes looks like cute red balls on the pasta..wonderful entry..
colorful and lovely pasta pavithra..
i am drooling..you have a wonderful recipe collection!